Capt. Peace, an intelligence officer stationed at Joint Base Lewis-McChord south of Seattle, is transgender. And although it’s been four years since the ban on homosexuality in the ranks was lifted, being trans is still a problem in the military. That’s about to change. But until the Defense Department crafts formal policies, transgender service members are in a complicated and sometimes frustrating position on how to handle bathrooms, bunking, pronouns – and haircuts. Peace’s hair sweeps neatly across her brow line and falls just below her ears. That’s a problem, because according to the U.S. Army, Jennifer Peace is a man. And her hair is too long to conform to the standards set for men. She’s been ordered to get it cut. Fixing that part of the military’s policy seems straightforward. Less clear is how open transgender service will affect combat roles, which aren’t available to women right now. Peace deployed to Iraq in 2008 and Afghanistan in 2012 as a man. And though her evaluations were good, she struggled with the way her body looked and with depression. She said it was in Afghanistan that she finally put a name to her angst. So nearly two years ago with her wife’s support, Peace started medically transitioning from male to female. She’s one of an estimated 15,000 transgender troops serving in the Armed Forces and reserves, according UCLA’s Williams Institute, which conducts research on sexual orientation and gender policy. Peace’s decision to transition had potentially devastating consequences for her career and for her family – she and her wife, Debbie, have been married for 11 years. They live in Spanaway, Wash., with their three children, and Peace said they’ve racked up $55,000 in debt for her surgeries. “I was scared the entire time,” Peace said. “We had so many conversations about what are we to do if I get kicked out? I&apos;ve got three kids and a mortgage like everyone else. The Army is what I knew. What would I do if was gone tomorrow?" Capt. 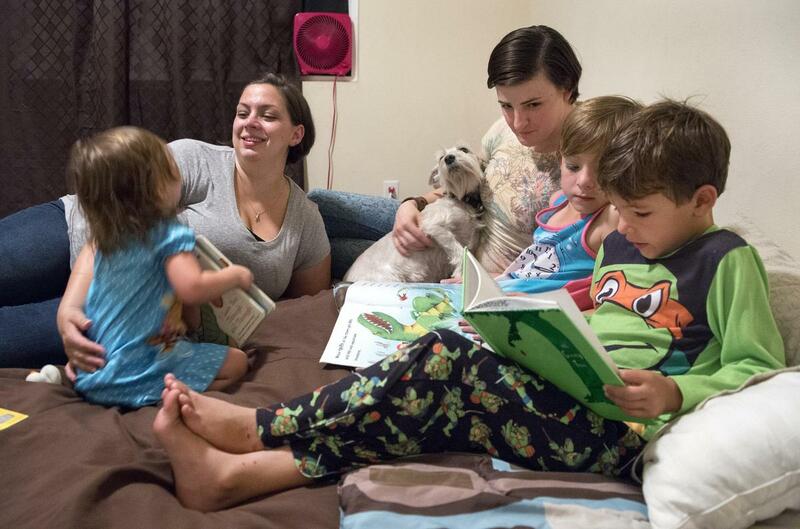 Jennifer Peace, center, and her wife, Debbie, at home in Spanaway, Wash., with their three children. That didn’t happen. And under an order from Defense Secretary Ashton Carter, a senior Pentagon official must review involuntary discharges for transgender service members. Carter made it clear in a speech for LGBT pride month at the Pentagon that diversity in the ranks is critical to the mission. But first there are the haircuts and the pronouns. Even though Peace has legally changed her name, her soldiers are under orders to address her as “sir.” When they didn’t do that at first, she said, both she and her soldiers were reprimanded by command. An Army spokesman said current policy is to treat soldiers for all purposes by the gender they held when they entered the service. Such issues will likely be addressed by a working group formed by Secretary Carter – as will more complex problems, like whether transgender troops will be excluded from any military jobs. These aren’t insurmountable issues, said Aaron Belkin, director of the Palm Center, an independent research institute that focuses on gender, sexuality and the military. Belkin said British, Australian and Canadian forces already have developed inclusive policies for transgender personnel. “In all of those experiences, sure, culture changes a bit because the troops aren&apos;t used to serving with openly transgender personnel, but the implementation issues are not difficult to solve,” Belkin said. The frustration for transgender troops is the time it’s taking. Be patient, counsels Sue Fulton, a former Army captain who now is president of SPARTA, a nonprofit that supports LGBT military veterans and their families. While Jennifer Peace admits she’s impatient, she’s also hopeful that soon the focus will be on her job performance, not her gender. “I think by this time next year, we’ll be talking about how well the implementation has gone,” she said.